Diabetes provides daily challenges for anyone who is dealing with this disease – whether an individual, a loved one or a friend. Told through the story of one person’s journey toward optimal health, the authors walk you through a new way of understanding your relationship to diabetes, or any chronic illness. This positive approach to diabetes will help you embrace choices that will empower you to enjoy all of your relationships with family, friends and your healthcare professionals, and enhance your well-being. …It takes time for a person to step into a resourceful and empowered relationship with a chronic disease. David was no exception. 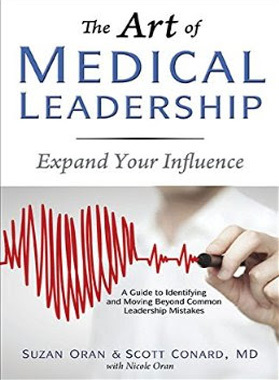 His personal journey while writing this book parallels the fictional character of the story: The ups and downs, the breakthroughs – all which lead to the character’s pursuits of his life purpose, and his experience of health and wellbeing. It is in this spirit that David and I have written this book. If you have diabetes or another chronic condition, we hope that you too will experience the power that TED* delivers in life. As you take your Baby Steps and see the flow of your life continually improve, we hope you will share your success with others and let us know the vitality and joy that you experience. Do you know the numbers to track and prevent TROUBLE in your life? This book will give you guidelines to learn about your health numbers, so that you can be in control of your health and take action steps to improve the chances of living a life without the major health concerns that could stop you from enjoying a full life. 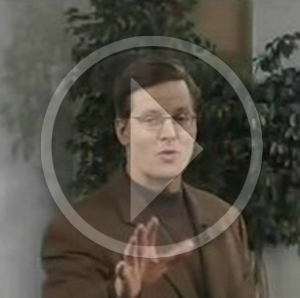 Dr. Scott Conard will share seven life giving principles to empower you as you take charge of your health. You will be more knowledgeable as you work with your health team to improve your numbers that will create the life that you want to live. 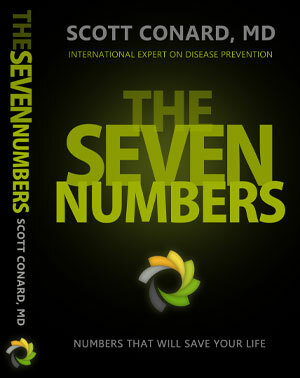 The Seven Numbers are: Training, Roundness, Oil, Unacceptable Sugar, Blood Pressure, Lousy Habits, Exploding Plaque. With the knowledge of The Seven Numbers, you can identify the areas for improvement and celebrate the areas where you are doing well. Jabez, a descendant of Judah, is briefly mentioned in scripture, like a blip on the screen-only two verses. In thirty words or less he lifted his prayer to God: “Oh, that you would bless me and enlarge my territory! Let your hand be with me, and keep me free from harm so that I will be free from pain.” And God granted his request (1 Chronicles 4:10 NIV). Using Jabez’s prayer and applying it towards healthy weight loss, it gives us seven powerful principles to effectively lose weight and live healthy, vibrant lives. 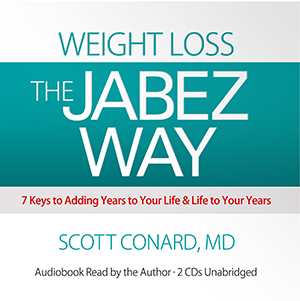 If your life has been a see-saw or roller coaster of losing weight and gaining it back, Weight Loss the Jabez Way was written for YOU! Do you want to live a healthy, fulfilling life? More than likely it’s your desire and your reason for picking up this book. Being healthy is not just a measure of our physical condition. It is also a measure and reflection of our beliefs, values, and habits that shape every area of our life. 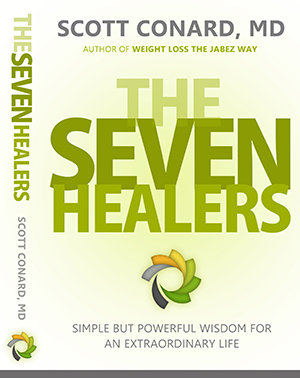 The Seven Healers are seven specific ingredients that every human being needs in order to survive and thrive in this life. The Seven Healers, in order of their necessity for survival are Air, Water, Sleep, Food, Play, Relationships, and Purpose. Without these elements, you cannot flourish and live a meaningful life. You can only live a few minutes without air. You can only live a few days without water. After about a week with no sleep, you will go insane.